Work on the control panel has begun! (at least the design aspect). Some might ask what’s the delay, isn’t making control panel just a matter of getting a piece of wood and drilling holes for the buttons and joystick. Indeed, there was a control panel that came with the cabinet when I first bought it. However, I had to chop down its width so it could fit in the new reduced width of the cabinet. Although in the past I showed a picture of that control panel (see 5th Jan 2013 entry) there was no way I was going to use it for the VecCab – it had too many holes in it and the finish wasn’t pretty). No, for the new control panel I wanted it to be perfect. This meant the number of buttons, the positioning of them and the joystick have to be in the optimum position. In addition I had some other requirements. I’ve seen control panels where the screws for holding the joystick are sticking out from the surface of the control panel. For me I don’t like this. I want the surface of the control panel to be completely smooth and want to later add a Lexan covering with coloured artwork. Also I am considering changing the joystick from a digital one to an analogue one in the future and this will surely mean different mounting hole positions. First off, I found a very good website called www.slagcoin.com. They give extensive information on the design and building of control panels. If you are making an arcade cabinet control panel, this website is well worth the read. There are multiple ways of mounting buttons and the joystick on a control panel. I went for a design what slagcoin calls “Top mounted, route double control panel”. Basically, the joystick is top mounted into a routed wood panel, and a further sheet (I used a Perspex) is placed on top. 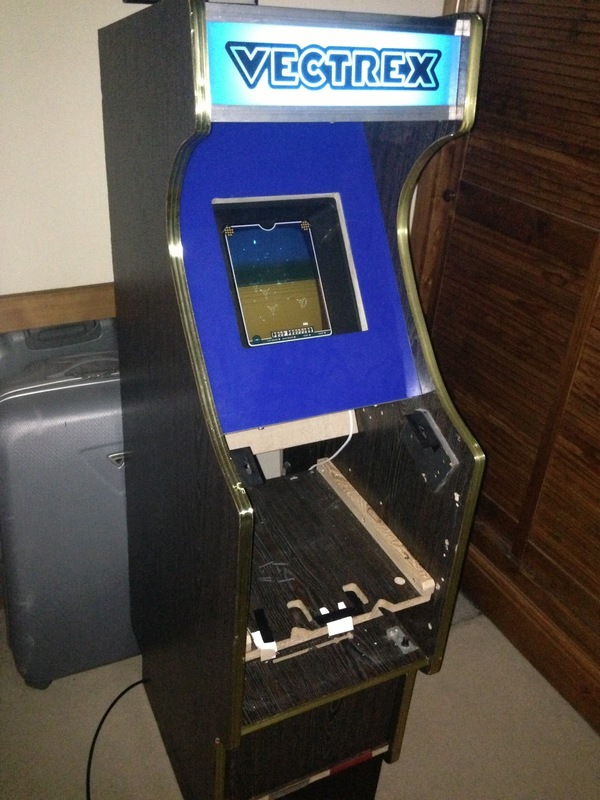 The next post will cover the placement of the joystick and buttons on the control panel. A lot of thought has to go into this as I don't want to have a control panel layout where after 10 minutes of playing you end up with a strain in your hand! Following on from the screen bezel cutting I just received the cut marque panels (I got my mate to cut them with his CNC cutting machine). One panel is made from the same blue Perspex as the screen bezel and one is a clear perspex. The blue Perspex although doesn't look translucent gives a nice glow when a light is shone from behind it. I bought another Vectrex sticker vinyl from "bigange83" on eBay and sandwiched it inbetween the two perspex layers. The blue panel is in the back and the clear panel is in the front. In theory, I could sandwich even a colour logo printed on paper and I might just use the Mine Storm graphics in the distant future (if I manage to hack the game so it is coin operated). To hold the marquee in place I used aluminium section. This can be purchased quite cheaply from many hardware suppliers but I bought two 19mm x 30mm angle sections (item no. 41-2683) from Clas Olson and cut them to the required width in the VecCab. This aluminium is useful stuff as I also used this to support the bottom of the screen bezel perspex and glass. The Vectrex joystick is physically small and would not be big or robust enough to use in a real upright arcade cabinet. So I have been looking for alternatives. As any Vectrex fan knows, the joystick controller is analogue rather than digital. This means pushing the joystick lever in a particular direction gives a voltage signal range rather and an on/off signal. The potentiometers in a Vectrex joystick work by voltage division and pushing the joystick lever from maximum up to maximum down gives a voltage in the range of 3.4V to -3.4V with 0V representing the lever in the centre position. A similar situation exists when pushing the lever from left to right. An analogue joystick can give finer control. Interestingly, there are not many Vectrex games that make use of the analogue functionality. Instead software in most Vectrex games simply processes the analogue signal as a digital value i.e. all-or-nothing joystick response. I’ve been searching several months for a large analogue joystick. Occasionally you see real analogue joysticks ripped out from old arcade machines but the pricing is very expensive (>£100!). You can also purchase brand new analogue joysticks for arcade machines (see the Happ Analog joystick at Gremlin Solutions ). Likewise you can find analogue joysticks used for controlling industrial machinery. However, all of these options are even more expensive and would require some extra circuitry so that the voltages generated are within the Vectrex signal range. Recently, I purchased some old home computer analogue joysticks for less than £5. I bought them to see if any of them could be modified and easily mounted in my future control panel for the VecCab. However, although electrically they could be modified to work with the Vectrex, it’s not going to be easy to mount them behind a control panel. I haven’t given up on modifying one of these joysticks but for the moment I've decided to pursue making a control panel using a digital joystick. There are already circuits presented on the internet which show how to interface a Vectrex to a digital joystick. 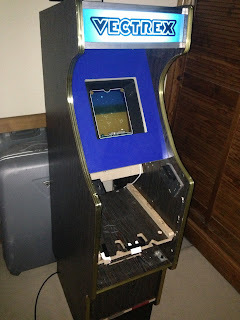 The only disadvantage of using a digital joystick is that some Vectrex games will not be playable. However, as these games are very few in number (Hyperchase comes to mind) the disadvantage is not that much of an issue. But one day I would like my VecCab to be 100% with all Vectrex games.